Enjoy a fantastic Round of Golf for Four at the wonderful Portmarnock Hotel & Golf Links, Dublin. The round is redeemable midweek in 2019, subject to availability. Take a look at the Portmarnock Hotel & Golf Links website here: www.portmarnock.com. Please make your bid realistic to the prize on offer. I understand by bidding that I am committing to make the purchase if I am the winning bid. Thank you. Please check your email for confirmation of your bid. The National Golf Club Challenge is the UK's largest amateur charity golf competition - the aim is to bring thousands of golfers together on their own golf courses throughout May, June and July 2019, in an unprecedented show of support for our injured and sick Service Personnel. This auction is run to raise funds for On Course Foundation. 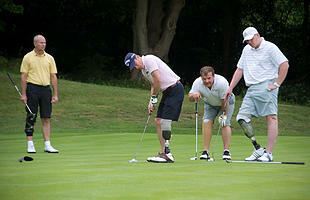 On Course Foundation help veterans and Armed Forces personnel to rebuild their lives using golf - to build their confidence, widen their network of friends and find employment opportunities within the golf industry.